By Kenneth Jung, P.E. and Bob Humer, P.E. Renovating the main runway at Oakland International Airport with asphalt in 14 days, working around the clock (24 hours a day, 7 days a week), and paving in echelon was the best option to avoid interrupting air traffic. Oakland International Airport (OAK), located in the San Francisco Bay area, is among the busiest airports in the nation and is of critical importance for the economy and air travel in the region. It serves over 12 million travelers annually. The 10,500-ft by 150-ft runway (RWY 12-30) is the airport’s main runway, capable of accommodating the largest aircraft used for international and domestic commercial flights, and it is open for operations 24 hours a day. The previous asphalt concrete overlay occurred in 2001 and had a design life of 15 years. Over the past several years, the runway surface exhibited increasing signs of wear and deterioration. A rehabilitation of the runway was ordered to secure the future safety of flight operations. For this major airport paving project, extensive planning with all stakeholders occurred in order to minimize the impacts of the project on air carriers, local traffic, population and economy. A short duration, full closure of the runway became the preferred option. During the previous rehabilitation in 2001, the adjacent taxiway was converted to and successfully used as a temporary runway (RWY 11-29). This option was again available to keep the flight operations going without interruptions. A fourteen-day closure was made available to the contractor to mill, profile and place approximately 92,000 tons of asphalt mix in several lifts, construct new inpavement light cans and install temporary pavement markings. Other project activities, including saw-cut grooving of the runway surface and installation of final pavement markings, followed the closure. Liquidated damages were a provision of the contract, commensurate with the financial impacts incurred by the airport and its customers (the airlines) if flight rescheduling would become necessary. The liquidated damages were set at $10,000 per day to reopen the runway at the end of the 14-day closure and $7,500 per 15 minutes for completion of work during the established weekly maintenance periods. In 2001, approximately 105,000 tons of asphalt mix were placed in five days over the full length of this runway. 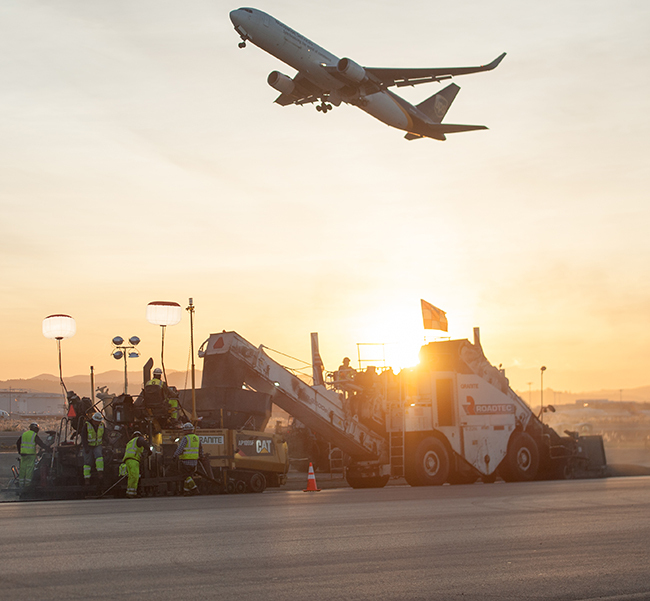 In 2014, approximately 1,000 ft. of each end of the runway was reconstructed as part of a separate project. This limited the paving of this project to the middle 8,400 ft. portion of the runway. Paving consisted of milling and placing approximately 92,000 tons of FAA P-401 asphalt concrete mix. Twice daily meetings were held to track progress and make decisions on construction issues. These meetings happened every day at 1 pm and at midnight. Based on a Pavement Condition Index (PCI) of “fair to low” and pavement strength evaluations, it was determined that several leveling and surface courses were needed to restore the pavement’s strength for future air traffic. • Two 3”-thick P-401 surface courses (PG 76-22). • Several P-403 base courses and leveling courses, as needed (PG 76-22 with reclaimed asphalt pavement [RAP]). In some locations, up to 11 total inches of new AC pavement thickness were installed to achieve the proper final grade for the runway. Approximately half of the total tonnage was for the two surface courses. Shoulders, base and leveling courses were specified as P-403 mix, while the approximately 50,000 tons of P-401 mix were specified for the two surface lifts. All lifts were tacked with diluted P-603 asphalt emulsion at a shot rate of 0.08 gallons per square yard. In general, the existing shoulders were milled down one-inch and the existing runway pavement was milled down 3.5 inches, with some variation in depth to correct the grade. The $47-million construction contract was advertised for bid and subsequently awarded to DeSilva Gates Construction of Dublin, CA. In order to complete all paving within the 14-day closure, the contractor, its subsidiary Gallagher and Burk of Oakland, CA, and its subcontractor Granite Construction of Pleasanton, CA, mobilized three hot mix plants and three paving sets operating in echelon. Using three hot-mix plants and three paving sets required three separate sets of mix designs, test sections and a lot of administration to keep the QC/QA data separate for each of the three paving operations. There was one paving set per hot-mix plant. To comply with the P-401 specification requirements this required absolutely no intermingling of the three mixes while paving. This separation of mixes was achieved, except for a few hours one day when a large accident on the Interstate 580 Freeway occurred. This was approved, but with the risk remaining with the contractor. Each paving company had their own paving operation and their own QC laboratory involved. Six mix designs had to be submitted and approved with test strips: three for the P-403 base course mixes using a PG 76-22 binder and three for the P-401 surface lifts with PG 76-22 binder. Echelon paving was only used for the final surface course in order to reduce the number of longitudinal joints. Each paving lane was 18.75’ wide. This resulted in cold joints only at the centerline, 56.25’ from centerline and 93.75’ from the centerline. The contractor received 100 percent pay based on percent within limits (PWL), with a few lots slightly below full pay compensated by lots with better than 100 percent pay. All acceptance criteria (mat density and air voids, stability and flow, joint density, thickness and smoothness) were met. Most flights used the shorter OAK North Field runways, while the heaviest aircraft used the 7,600 ft. long temporary Runway 11-29. There were no flight cancellations as a result of the construction work, although flights that used the North Field runways took a little longer to taxi to their designated runway. An important part of the planning was the communication with the local authorities, media and public so that all were aware of the increased trucking, changed noise pattern and security issues. The haul routes near the airport and on the airside (within the fences) especially needed to be planned and adhered to. Fortunately, this airport has perimeter access roads which allowed truck traffic to be one-directional on the airside, with relatively straightforward access to the paving areas and without the interference of flight operations. All paving was successfully completed within the 14-day contract time and no construction delays occurred. Only with asphalt can this type of airport renovation project be conducted with limited interference to air traffic operations. It is truly the preferred pavement choice in such cases. Jung is Resident Engineer at the Port of Oakland. Humer is an Asphalt Institute Senior Regional Engineer based in California.